I’m back! I stumbled off of the blogging track, but I am back today with a fun post to get me back into the swing of things. Next week I’ll catch you up on the highlights since well….April. 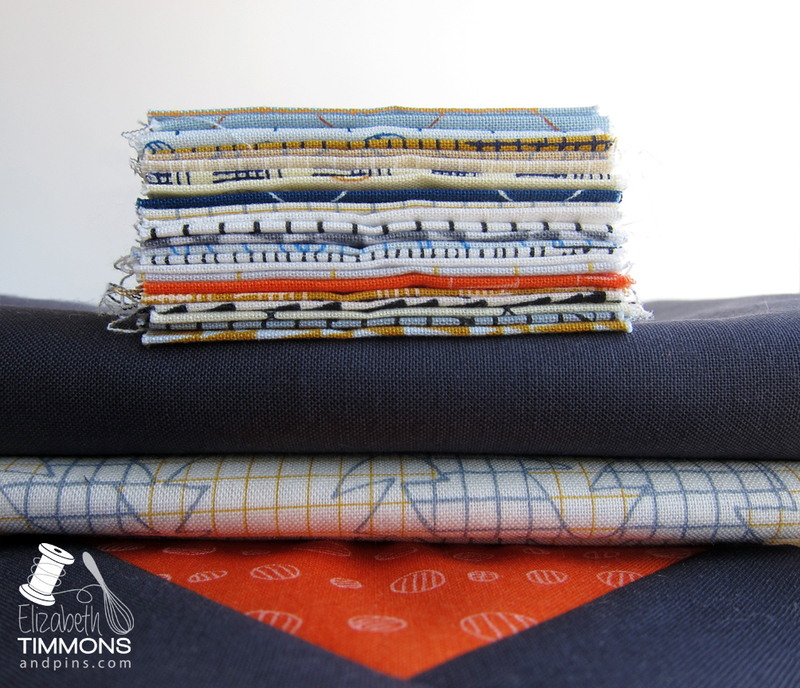 I am thrilled to be a part of the #whatshaderu blog hop with RJR Fabrics celebrating their Cotton Supreme Solids today. I was floored when RJR approached me to participate (the day after my birthday! ), but I didn’t hesitate to say yes. Fast forward seven months and here I am with my Wonky Runner! 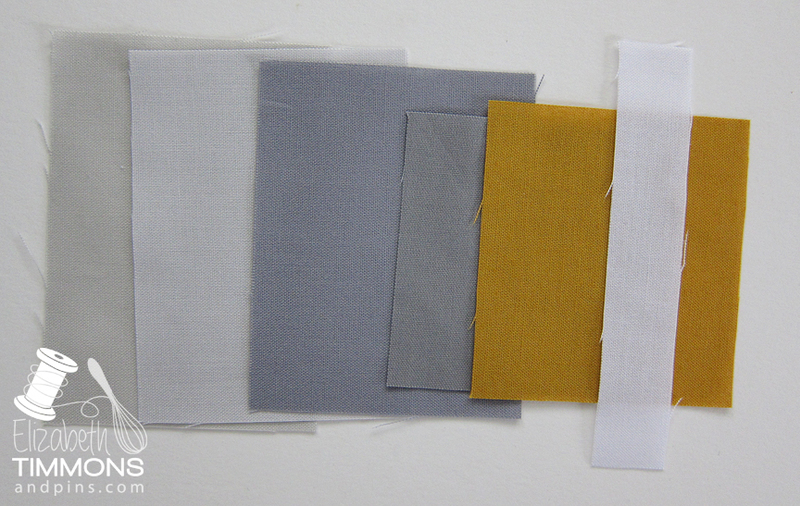 I chose a palette of grays, white, and mustard for our bedroom and set out to make a runner to pull the the mustard to the foot of our bed. I was inspired by the gorgeous illustration by Cara @Print Stitch & Paste and after getting her blessing, I set out to reproduce it in fabric! The cards are available in her Etsy shop if you love them as much as I do. I had a great time playing with the Cotton Supreme solids and working in a slightly less accurate style then I’m used to. It was a great way to stretch my comfort limits and work through some creative fears. I was aiming for a slightly off kilter and wonky look, which I think I accomplished. I struggled a bit on how to quilt it. Originally, I was going to and matchstick it evenly (top of above photo) with gray and a pop of mustard thread here and there. I paused halfway through to look at my progress (to make sure the lines were not leaning sideways) and fell in love with the texture that the uneven spacing added to the quilt (bottom of above photo). My seam ripper and I had a date one evening! I have yet to settle on a binding color, but here are the options I am considering. Want to make a runner of your own? With a yard of white, a half-yard each of five colors, and some careful cutting you can make enough blocks to create four full diamonds. My runner is two diamonds in the center, a half diamond on each end, with a diamond on the back. Make 16 stacks that contain one a, b, c, d, and e piece. Randomize the stacks so no two are alike (or few are). Piece together along the 13″ length your colors with a white strip alternating in between. Your start and end piece will be a color. Press seams to colors. Repeat until you have 16 blocks. I keep telling myself that wonky is what I'm aiming for with this project. Brain isn't getting the memo. Roughly square up your blocks to be 13 x 13″. Divide blocks into two stacks of 8. Cut half of them diagonally top left to bottom right and the other half bottom top right to bottom left. You want to make opposite cuts. Layout your (now) triangle blocks on your design wall, bed, table, or floor and move the blocks around until you find the arrangement that you like. Measure the length of your diagonal line and cut sixteen 3/4″ strips of white a 1/2″ longer than your measurement. This will be the piece that makes the triangles block again. Sew 3/4″ strip along the diagonal of the first triangle, press to the colors. Offset the second triangle 1/4″ from the top edge of the first triangle, lining the diagonal cut against the white edge and sew. Press to the colors and you have a squarish block again. Repeat until you have 16 blocks. Measure the width of your new blocks and cut eight 3/4″ strips of white a 1/2″ longer than your measurement. 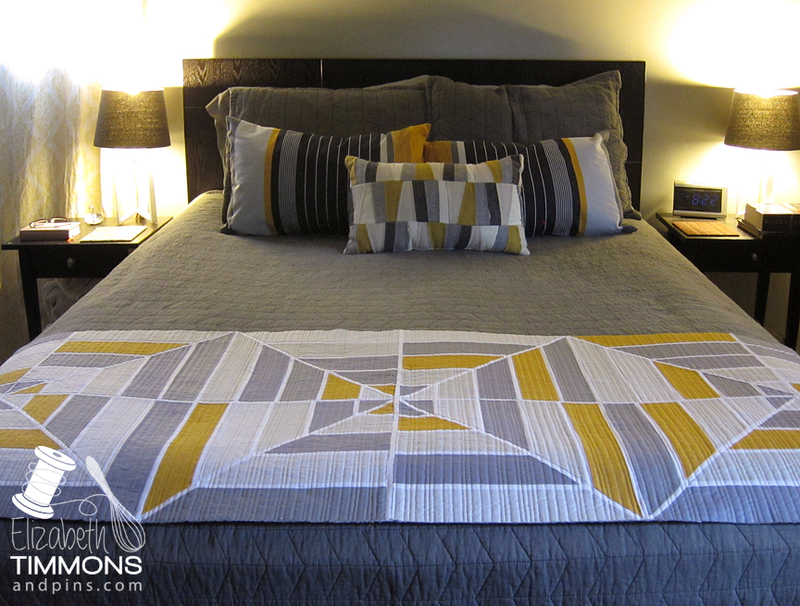 Sew your white strip in between two vertical blocks to make eight individual two block units. Press to the colors. Measure the length of your vertical blocks and cut seven 3/4″ strips of white a 1/2″ longer than your measurement. 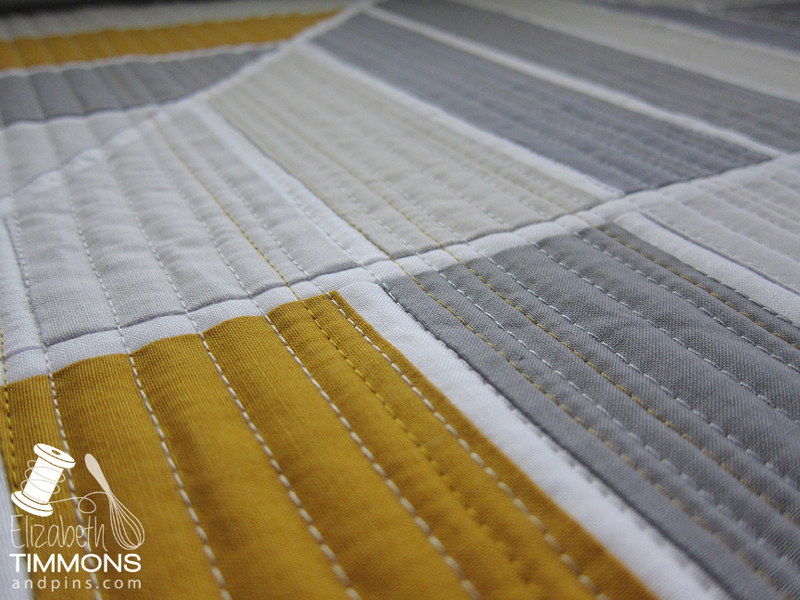 Sew white strips in between each vertical block to finish the runner. Press to the colors. Quilt and bind to your liking! 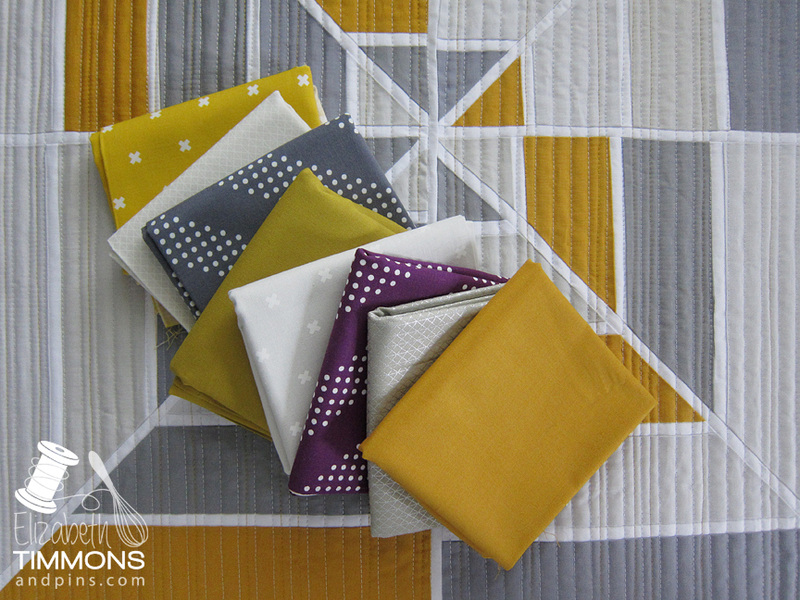 RJR Fabrics is generously giving one lucky reader a fat quarter bundle of my color set which includes Golden Topaz, Pewter, Argento, On The Rocks, Silver, and Goldilocks. 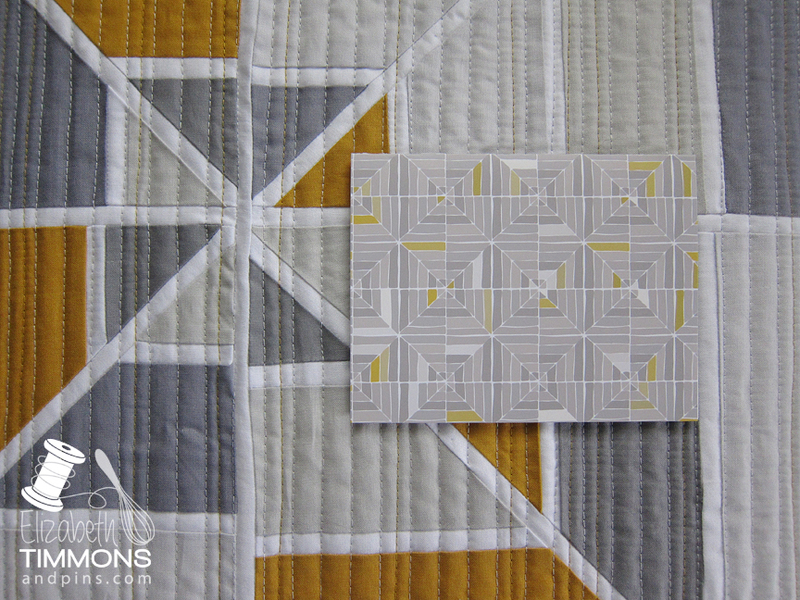 Goldilocks is another mustard option, my quilt uses Golden Topaz. To win, leave me a comment telling me what color combination you are loving today. Mr. Random will pick a winner next Wednesday evening, August 12th (8pm EST) and I’ll announce it here. I’ll be sending the winner a note card in the mail, the one that inspired the project. To keep things real, this is what happens when I photograph quilts in my house! I think they approve. I feel like running around and shouting, “I finished a quilt top, I finished a quilt top!” This is my first big piecing finish of 2015. 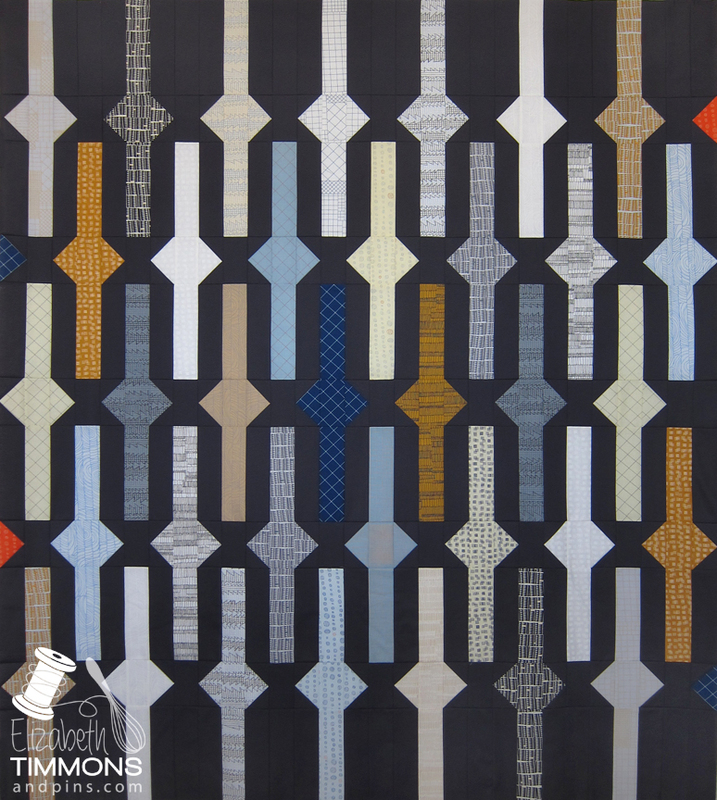 I present to you my version of Rebel Craft Media’s Belts & Buckles Quilt designed by the lovely Melissa of Tension Issues! 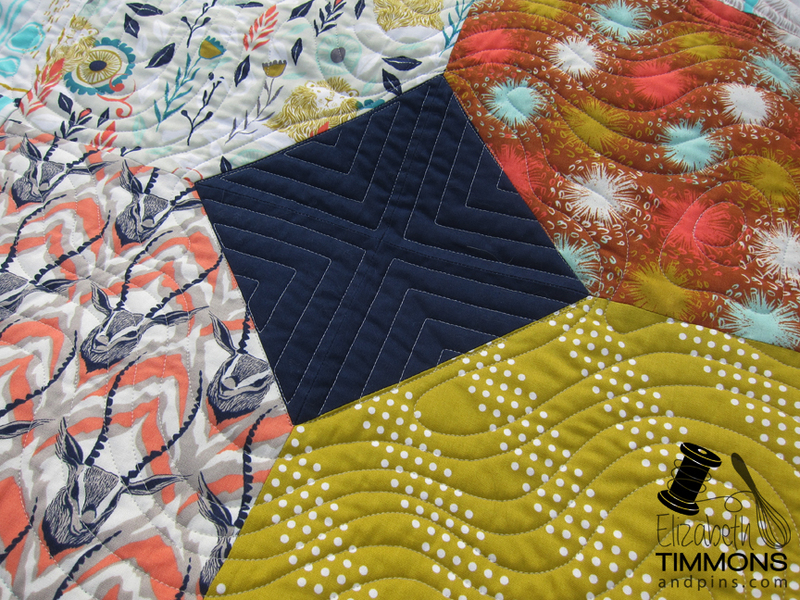 I took a bit of liberty with the pattern and left out some patterned partial buckle and belt units along the edge of the quilt and subbed in some charcoal and some bright orange. 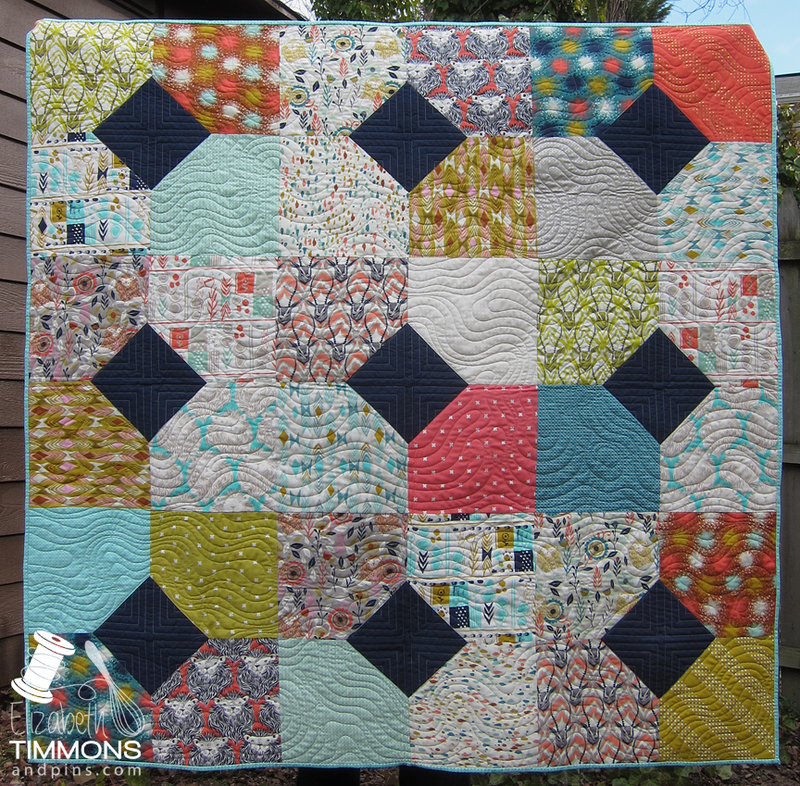 I love the dimension, edges, and movement that my decision gives the quilt. I used a Carolyn Friedlander Doe roll-up with the exception of the teal fabric, Kona Charcoal for the background, and I am planning on using Lighting in Yarrow for the binding. I am currently debating on making the top bigger with some sashing and a few more bits of orange for my guest bedroom, which is why it is not finished. 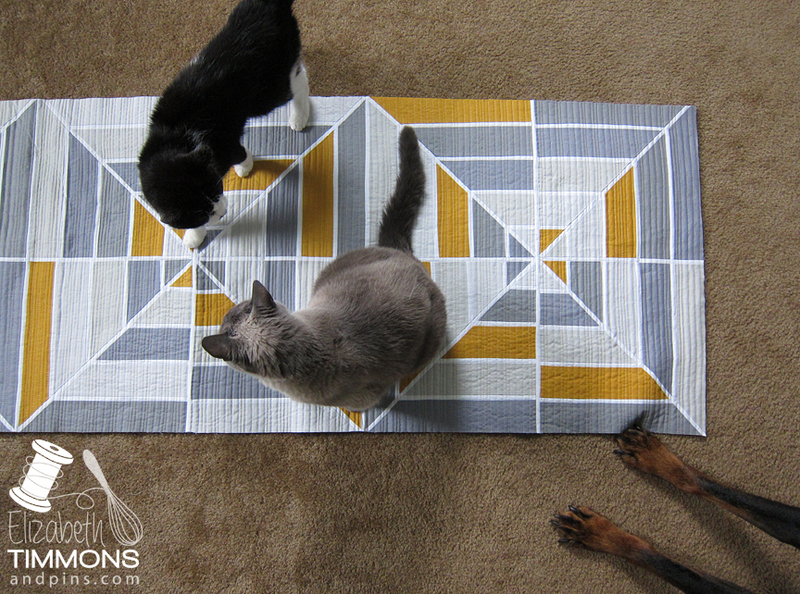 I worked on it during the #sewingathomecon weekend while drooling over everyone’s QuiltCon photographs on instagram. I created quite a bit of goose poop! To celebrate the release of this fun pattern, Rebel Craft Media has given me a copy of the pattern to give to one of you. Since the weather was warm, sunny, and I was able to ride home with the sunroof open on Monday afternoon, leave me a comment telling me what you are looking forward to this spring. Personally, I am looking forward to seeing some old friends and meeting new ones at Mid-Atlantic MOD, closing on our new house (eek! ), and enjoying the warm sunshine. I’ll close the giveaway on Monday evening, 7pm EST. 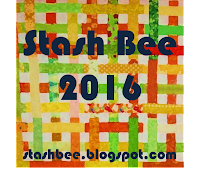 Be sure to check out Rebel Craft Media’s blog the rest of the week to see the other featured pattern testers. It is always fun to see how other people work with a pattern! Melissa posted a awesome piecing trick on Monday, Carla, Abbie, me, Katie, and Kaitlin round out the week. 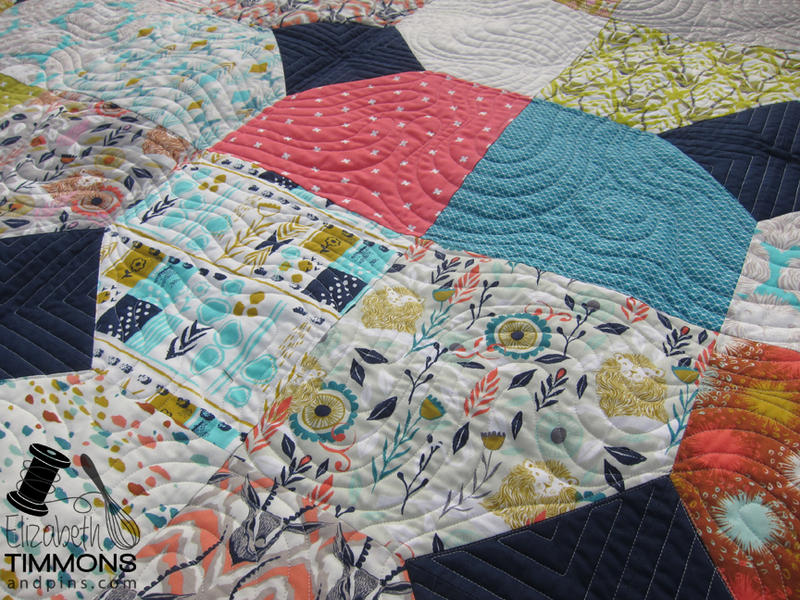 Layers of Charm is a quick, easy pattern that uses a layer cake and a set of charm squares to create a dynamic & fun quilt. I seriously spent more time debating on which layer cake to use and determining the layout of the fabrics than I did actually sewing the top together! This is the second short cut pattern by the Fat Quarter Shop that I have used. My grandmother’s quilt started with their Jelly Roll Jam pattern. Make sure you check out their video tutorial! I finally decided on August by Sarah Watts for Cotton + Steel and a stack of Navy Bella. The prints are 10″ squares and the diamonds were formed using 5″ charm squares. 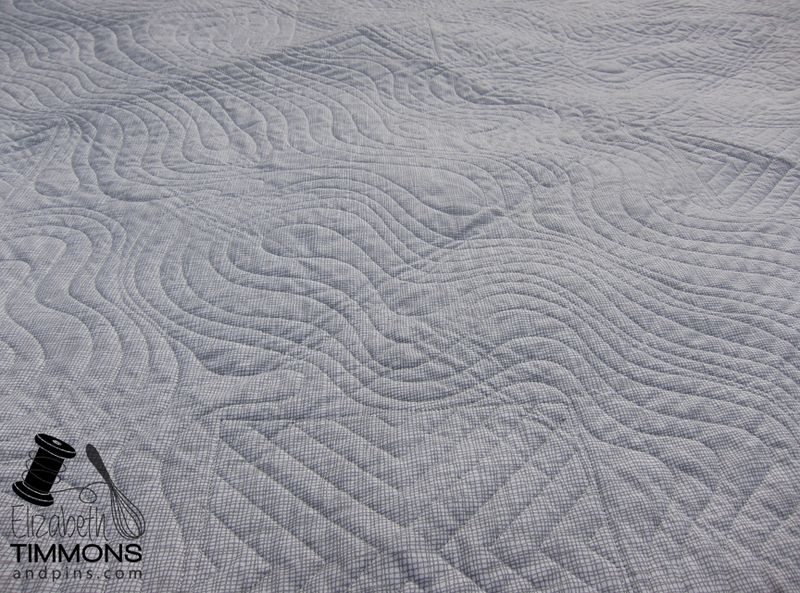 Do to the timeframe involved in this quilt, I sent it to my friend Tia Curtis to have it quilted. She did custom typography in the prints and geometric lines in the navy diamonds. 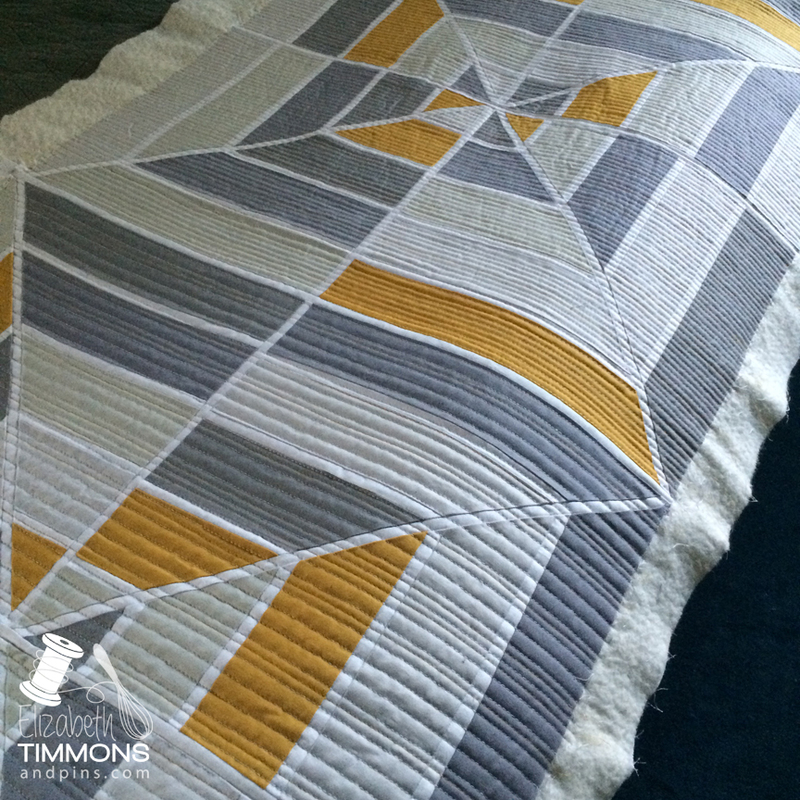 I am completely thrilled with how this quilt finished! So much so that it will have permanent residence in my house after the Southern Comforters of Bowie quilt show in March. The photos were pre-wash since I was running out of daylight, but it crinkled up beautifully! 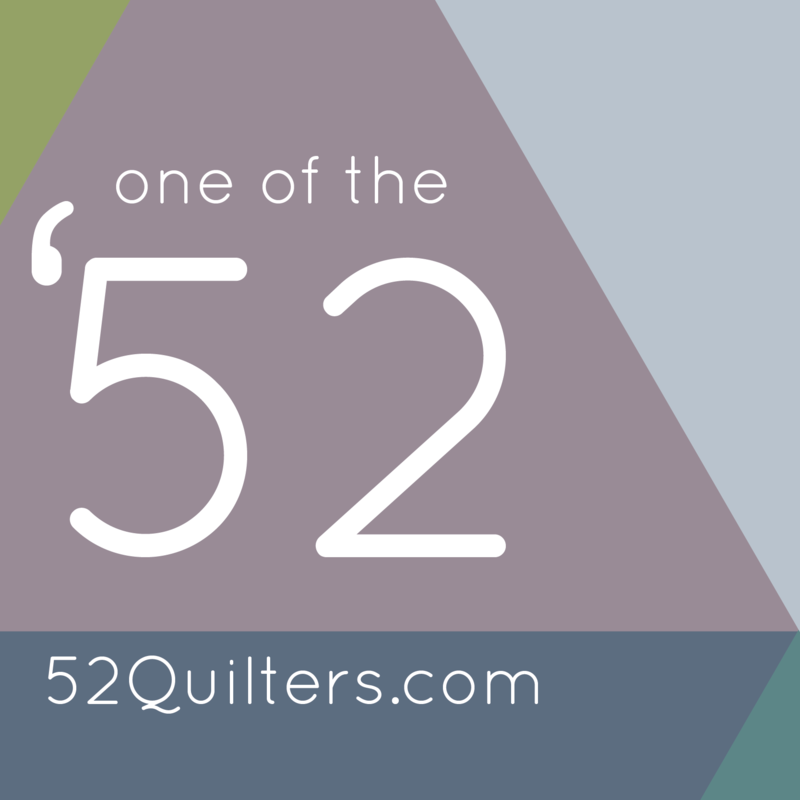 To enter to win, check out the Fat Quarter Shop, tell me what combination of layer cake and charm squares you would use to make a Layers of Charm quilt, and use the Rafflecopter below to let me know your details. I will let Mr. Random pick a winner at 9pm EST on Friday, February 13th. Congratulations to Lori S. who said that she would use 3 Sisters Favorites Layer Cake and Lorikeet Bali Scraps Charm Pack!